MOSCOW, January 12. /TASS/. 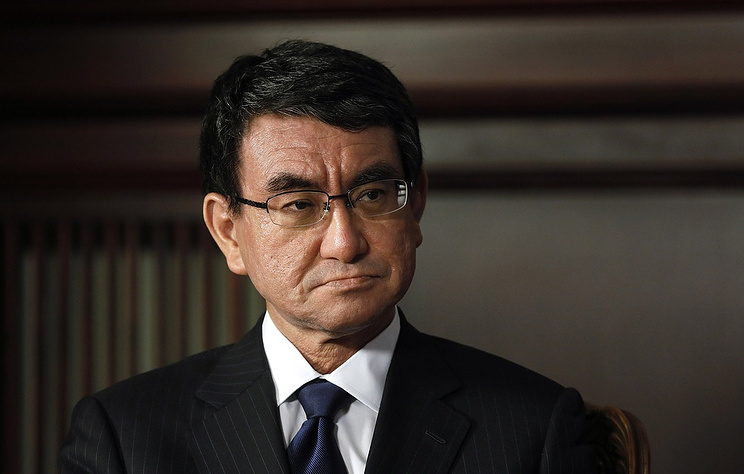 Japanese Foreign Minister Taro Kono has begun his five-day visit to Moscow, which is scheduled to focus on a peace treaty in talks with Russian counterpart Sergey Lavrov, a diplomatic source told TASS on Saturday. "The minister has arrived in Moscow," the source said. Japan’s embassy does not disclose details of Kono’s lengthy visit to Russia, citing confidentiality considerations. Russia’s Foreign Ministry said that the two top diplomats would hold talks on Monday morning. On November 14, Russian President Vladimir Putin and Japanese Prime Minister Shinzo Abe agreed at the Singapore summit to accelerate the Russian-Japanese peace treaty talks on the basis of the 1956 joint declaration. On October 19, 1956, the Soviet Union and Japan signed that declaration on ceasing the state of war and restoring diplomatic and consular relations, but no peace treaty has been signed since then. Russia and Japan have been in talks to sign a peace treaty since the mid-20th century. The main stumbling block to achieving this is the ownership issue over the Southern Kuril Islands, called the Northern Territories in Japan. After the end of World War II, the Kuril Islands were incorporated into the Soviet Union. However, the ownership of Iturup, Kunashir, Shikotan Islands and the Habomai Islands has been challenged by Japan. The Japanese government believes that after the end of WWII, the islands "have been under occupation," so Tokyo has the right to demand compensation from Moscow for their country and for former Japanese residents. Tokyo earlier claimed it was necessary to ‘get understanding’ from the Southern Kuril residents over ‘the handover of the islands to Japan." Russia’s Foreign Ministry has stated many times that Russia’s sovereignty over the islands is beyond doubt. On January 9, the Russian Foreign Ministry summoned Japan’s Ambassador to Russia Toyohisa Kozuki to remind that those statements from Tokyo "grossly distort the essence of agreements between the leaders of Russia and Japan. ".